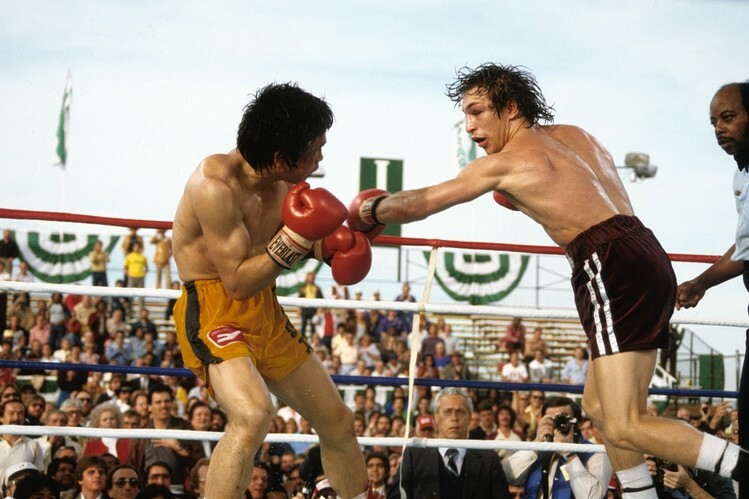 I’ll never forget watching the Ray Mancini vs Duk Koo Kim match on live television as a child. 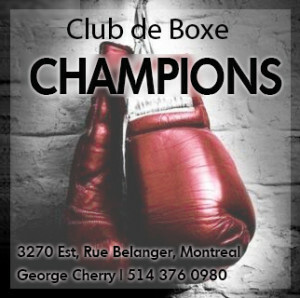 Mancini was a favorite boxer of mine and on that late Saturday afternoon he was in the fight of his life. South Korea’s Kim hadn’t come to play or to lie down; he was there to give everything he had to defeat Mancini and take his WBA lightweight title strap. Yet Mancini was nothing if not a warrior. On and on he struggled; on and on he fought. Watching that thrilling battle in my grandparent’s house, I convinced my mother not to pack us up and leave until it was finally over. Indeed, Mancini pulled off a dramatic and unforgettable win, a victory to revel in, if it weren’t for what that win led to. 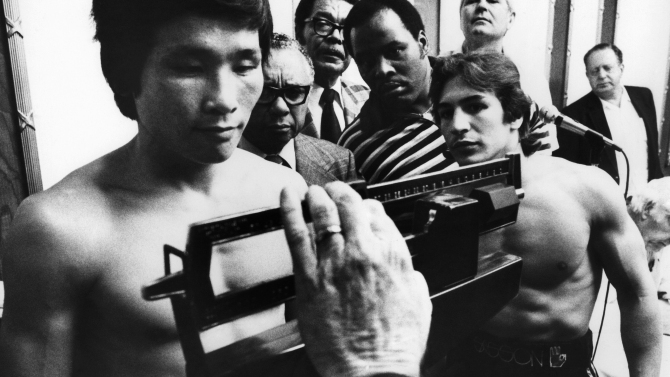 Ray Mancini watches as challenger Duk Koo Kim weighs in for their 1982 title fight. Shortly after the bout was stopped, Kim lapsed into unconsciousness and just days later he died. The entire sporting world was shocked. Mancini, one of the most personable people my adult self has had the pleasure of speaking with, was traumatized. The incident led to some significant changes in the sport (there’s a reason we no longer see 15 round title bouts) and once again brought to the fore grave concerns for fighter safety. I’ve personally never joined in with the “boxing is immoral” chorus, even though I’ve seen numerous lives destroyed over the years. Why? Because boxing isn’t something out of the film Gladiator. The goal isn’t to kill or maim; it’s to get the better of one’s competitor. That’s it. If the intent is sound, goes the logic, then so too is the sport. And again, the intent of boxing is not to kill or destroy. Still, this is an exceedingly dangerous endeavor we’re talking about. And precautions must be taken. In fact, it’s morally imperative that people abide by the rules. This isn’t baseball or soccer. This is pugilism. It’s already dangerous enough. When people break the rules, people can be killed. It’s that simple. And that’s why I have zero patience for the use of performance enhancing drugs. People smarter than myself take to the internet all the time, educating the rest of us on how a certain percentage of a certain illegal substance in a certain boxer’s blood stream doesn’t mean the fighter is guilty of cheating. And my response is always the same: I don’t care. People who fail drug tests need to be suspended for some period of time. It’s that simple; cut and dry, black and white. It’s not a matter of guilt or innocence or intent, as far as I’m concerned. It’s a matter of safety. Which, of course, brings me to Canelo Alvarez. Perhaps the most popular boxer in the world, Alvarez recently tested positive for clenbuterol, a banned substance. 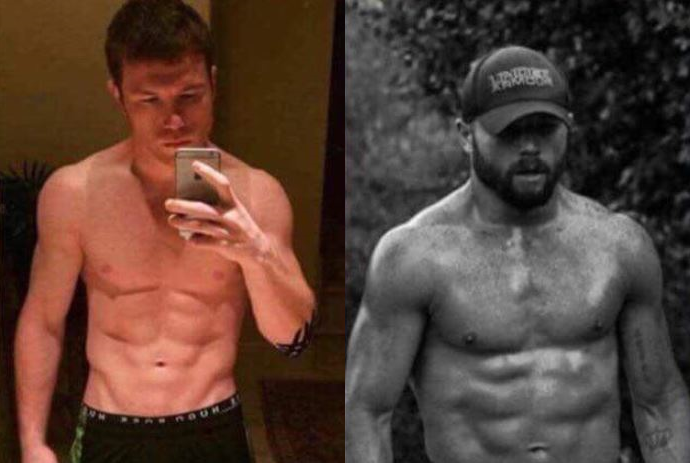 The argument goes that Canelo ingested it by eating tainted Mexican beef, and, reportedly, there is a history of Mexican beef containing clenbuterol. In other words, failed drug tests and Mexican beef consumption appear to have a legit connection. But again, I don’t care. For all I know, Canelo is completely innocent. But the bottom line is he’s tested dirty and he needs to be suspended. I don’t see this as being a knock on the fighter’s character; I see it as a precaution. And a necessary one. Because Canelo can hurt you. Check out his fights with Amir Khan and James Kirkland if you don’t believe me. 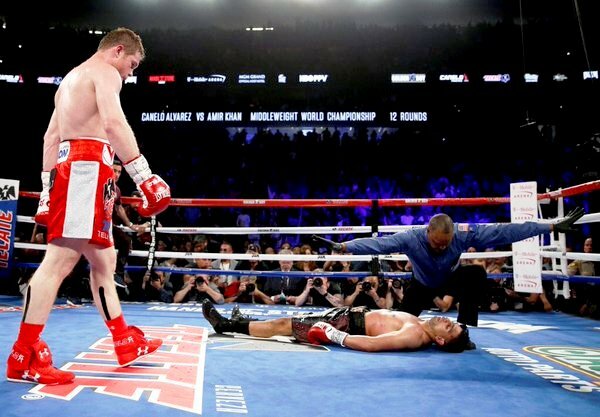 Canelo KO’s Khan: the prime concern here must be fighter safety. To be clear: I am not charging Canelo with malicious intent. I am not declaring that he willingly and knowingly attempted to cheat. I believe in giving people the benefit of the doubt. What’s more, I like the guy. He’s been a complete gentlemen on the few occasions I’ve spoken with him and I admire him as a fighter. But the bottom line is he failed a test and he needs some time away from the ring. If we know anything about PEDs, it’s that they can be hard to detect. If he’s vulnerable to ingesting clenbuterol, what else is the man vulnerable to? Again, there’s a precedent here. Let’s keep fighter safety at the forefront of our thinking on this. The “shut up and let these guys earn their money” argument just doesn’t cut it. Again, people die in boxing. Or get severely hurt. We all know this. 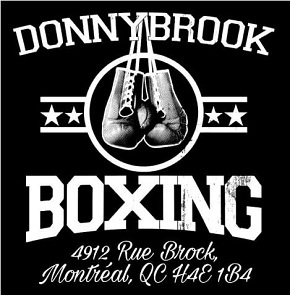 We all know the names: Benny Paret; Duk Koo Kim; Magomed Abdusalamov; Gerald McClellan; Prichard Colon; Scott Westgarth. Many more can be added. And right now, those names should be on our mind when we think about how boxing responds to this most high profile of positive tests. 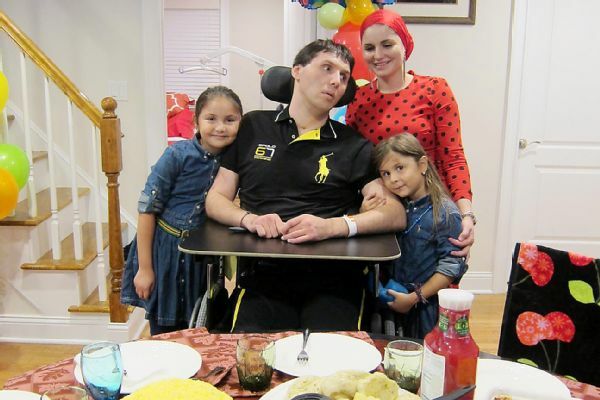 Former heavyweight contender Magomed Abdusalamov with his wife and children. Now it’s only fair to admit that there’s room for error here. Even honest boxers could get screwed royally because of circumstances legitimately outside of their control. For instance, a substance only recently banned could be in a fighter’s system because he took it before the ban went into effect. 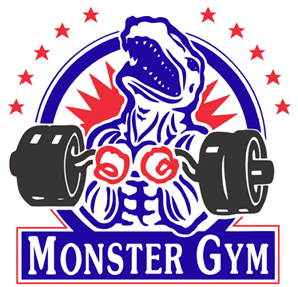 Or it could find its way into a supplement he or she had every reason to believe was clean. Too bad. If we’re serious about discouraging the use of performance enhancing drugs in the most dangerous of sports, than exceptions are not an option. You’re either clean, or you’re not. And if you’re not, you have to pay the price. It’s as simple as that. Again, athletes can and will get screwed because of this sort of thing, and I’m all for those fighters being fairly compensated, if such a thing is possible, but athlete safety must be the top priority. The rematch is scheduled for May 5: Will money trump safety? Sadly though, it probably won’t be. Ruling bodies are already openly siding with Canelo in the aftermath of his failed test and there’s little reason to believe the Nevada State Athletic Commission won’t live down to its reputation here. Why? 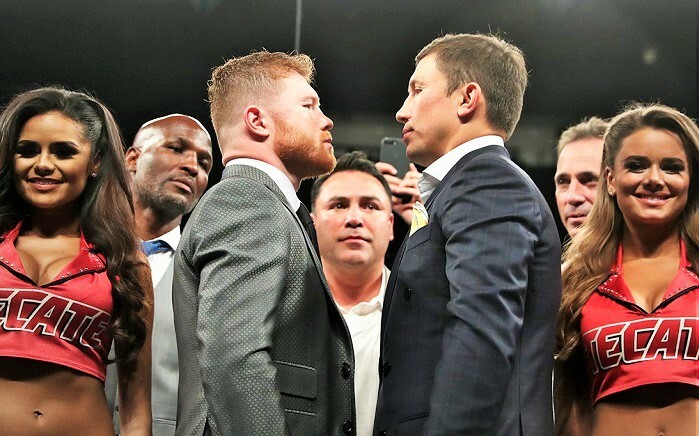 Because Canelo’s upcoming rematch with Gennady Golovkin is to take place in Canelo-friendly Las Vegas. And there’s an awful lot of money to be scooped up by everyone involved. Here’s something to keep in mind, though. Boxing is in a good place right now. People are tuning back in. But they won’t be, if someone gets permanently damaged or killed as the result of something preventable occurring during a high level fight. If money is the motivating factor in boxing, then a serious loss of revenue might also be a consideration. But it would be sad, to say the least, if that were the only consideration. Great article. I’m shocked he’s not even going to be suspended like Ortiz was. Clear bias as usual. Didn’t he opt out of drug testing for the Smith fight? Might explain how he made weight despite saying in interviews he fights at 155 cuz 154 was too tough to make. Canelo cheated. For years it’s been crazy how he’s been able to take off so much weight without seemingly killing himself. It was a wonder that many suspected was a case of PED use. And then he refuses to use VADA for the Smith fight, knowing he’d have to come down in weight. Suspect again. Now he tests dirty before a career defining fight where he’s tested earlier than normal Yea, ok Canelo team is so dumb to risk him eating tainted beef while getting ready for this fight. A guy with his own ranch, butchers in his team, and millions of dollars. No way.